Queen are the 5th highest selling recording artists of all time. They played their first concert in Truro, Cornwall, and made many visits in the late sixties (as 'Smile') and early 70's (as 'Queen'). Prior to joining 'Smile' and forming 'Queen' Roger Taylor gigged all over Cornwall with his band 'The Reaction'. This blog is an attempt to document these musicians and concerts in preparation for a book and fan club event. Mike Grose - Queen's first bassist (pictured above to the left of the picture) - hasn't spoken to any journalists or writers for more than a decade but he is still in Cornwall and I managed to get hold of him on the phone today. He said it was PJ (Pete Bawden - see earlier post below) who persuaded him to pick up the bass and play with Smile at PJs in Truro after Tim Staffell left the band early in 1970. He said they were playing a lot of covers and blues standards so he didn't really have to rehearse beforehand. Also, significantly, with Tim the lead singer having left, that night he remembers sharing the singing duties with Brian and Roger. A few days later Roger Taylor phoned him to invite him up to London to join the band permanently. He lived in Barnes for 4 or 5 months, and remembers rehearsing with them in the garden in Barnes and at Imperial College. 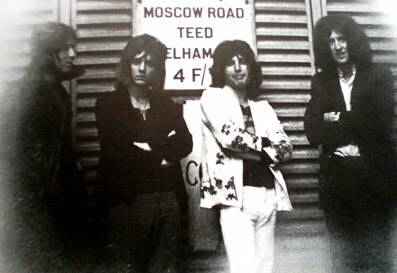 Many of the songs featured on the first album, and were only half-formed when Brian or Freddie, the main song-writers, presented them as ideas to the rest of the band. It was whilst in the garden in Barnes that he remembers Freddie coming up with the name 'Queen'. Everyone recognised the gay connotations of the word, and he thought it risky in that sense but memorable. I'm expecting to meet up with Mike soon which should be great. That would be GREAT to see the photos ! I have been going my genealogy, and Mike and I are related!!! I believe!!! How exciting to finally know where my Grandfather's cousins turned up!!! I wouldn't know how to contact him, but this was a great read! Thank you!!! Mistakes, tricks of the mind or poetic license?